Volkswagen is a company that has built a strong reputation on delivering value for money. Not always the cheapest, quality has played a part in it becoming one of the biggest names in the business and a key part of that is delivering cars with affordable insurance costs. As you can see from our top 10 picks of the VW line-up, that applies across the board, whether you need a city car, family crossover or convertible. 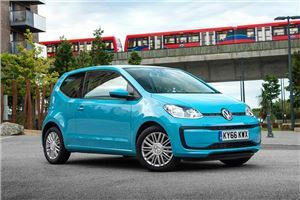 Cars don’t get much cheaper to insure than the Volkswagen Up thanks to its Group 1 banding. This does mean you’re limited to the 60PS version of the 1.0-litre petrol engine found in all models, but you do have a choice of manual or automated manual transmissions. There’s plenty more to like, such as the 68.9mpg and 96g/km CO2 emissions. There’s also a surprisingly spacious interior despite the dinky exterior dimensions and the Up is one small car that’s equally at home on the motorway as it is in the city. 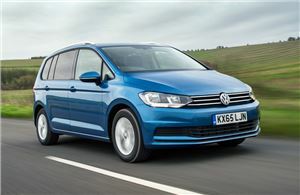 The world may be obsessed with crossovers, but the Volkswagen Touran plenty of space for those who need to carry five or seven passengers regularly. So, that’ll be families and minicab drivers, and that means low insurance premiums are an important consideration. Luckily, this version of VW’s MPV sits in Group 10. 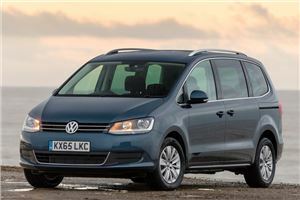 Other reasons the Touran might slot into your life are the individually slide and fold rear seats. Combined economy of 61.4mpg is good, too, though you need to go for the DSG auto if you want to improve that 65.7mpg and that means going up two insurance groups. 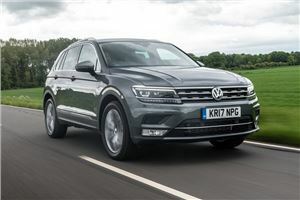 The Tiguan is a little pricier than many of its direct rivals, so it’s just as well this 1.4 TSI version is here to reduce running costs with its Group 11 insurance. That’s as much as 16 groups lower than some of its sister models, yet you won’t feel short-changed with this one. The 1.4 turbo petrol engine is lively and easy on fuel, and the Tiguan majors on refinement. Okay, you only have front-wheel drive, but who really takes these cars off-road? Very few, so you won’t miss it. The Sharan is one of a rare breed now: a full-size seven-seat MPV. Where once they were ten-a-penny, now the classy Sharan and its Seat sister model account for a large slice of the sector. It’s easy to see why some still choose the Sharan courtesy of its sliding side rear doors for unhindered access to the second and third rows of seats. You also get a commanding driving position, though this car is never going to set your pulse racing in the driving stakes. 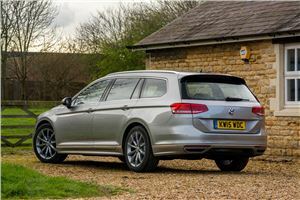 There's little in life that’s as dependable as a Volkswagen Passat Estate. You know it will carry the family and luggage with ease, plod dutifully up and down motorways, and comes with decent running costs that won’t ruin you. The Whatta? 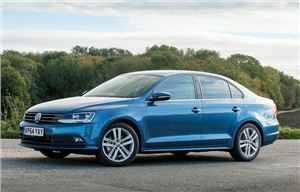 You may well ask as the Volkswagen Jetta is not a big seller in the UK, though it has many fans in the USA. 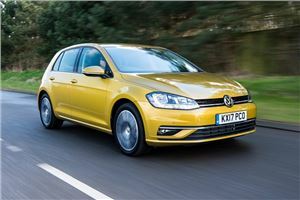 Essentially a saloon version of the Golf, it’s not as practical as its hatchback sister but it steers, rides and handles with the same unerring competence that demands little of its driver. How could we talk about Volkswagen and not mention the car that encapsulates the Wolfsburg firm? Yes, it’s the Golf in the umpteenth generation and going stronger than ever. You’ll love it for all the reasons we do: comfort, quality, practicality. We’re also keen on this 1.6 TDI model as it comes with the lowest insurance banding of any in its range. Even better news is the 1.6-litre turbodiesel can be had in three- or five-door forms and offers up combined economy of 68.9mpg. 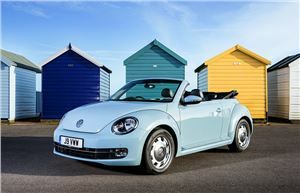 The Beetle Cabriolet may be a drop-top, but the only thing you’ll find it dripping in is retro appeal. This second-generation Beetle gets it spot on and you can add to the period charm with some choice extras. It has four seats and the fabric roof goes up and down in a nifty 11 seconds at up to 31mph on the move. Given it’s not the last word in dynamic driving, you might as well choose the 1.2 TSI petrol for its easy-going nature and Group 11 insurance bracket. After all, who cares about flat-out speed when you’re cruising with the roof down? 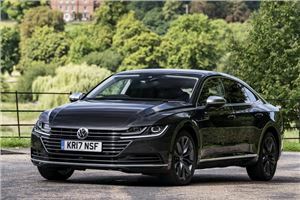 If you can overlook the somewhat stiff list prices for the Arteon range, you’ll find Volkswagen’s CC replacement a very stylish four-door coupe. It’s strictly a four-seater, but everyone gets good leg, head and shoulder space, as well as superbly comfy chairs. Under the bonnet, you could go for more potent petrol or diesel engines, but the 150PS 2.0-litre turbodiesel does a perfectly good job. It also sits 10 insurance groups lower than the other versions, so it’s the one we’d head for in Elegance or R-Line trims. Given the spate of compact crossovers arriving on the market, the Volkswagen Touareg could almost get forgotten. That would be a shame, in our view, as it’s a very capable, comfortable large SUV. 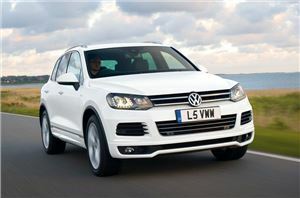 Quality is up there with the best in class and the VW can handle off-roading easily. To keep running costs reasonable, the 204PS 3.0litre V6 turbodiesel is the one to go for as it sits in Group 35, five bands below the more potent version. Even so, you’ll be hard pressed to notice the difference in performance.